The big day is almost here and things are hotting up! Three things you, the cacher, will need to know about this Event. 2. The CITO is the main reason why we will all be in Archallagan Plantation and we hope that you all enjoy the evening and also collect as much data on the “Marker Posts” as possible. The idea is that as you wander around the Plantation you will spot marker posts. A list and map of their approximate location will he handed out at the start of the Event along with post numbers and examples of what data we want collecting. All will become clear on the night, but just for an added incentive there will be prizes for the team with the most post data collected and the best averaged co-ords on Posts No. 5, 20, 29. or if you don’t fancy doing that there is the challenge of trying to find some litter in these woods. The prizes will be presented at the Shiaulley dys Shibber, Sailing to Supper Event. 3. Now a Geocacher won’t wander around in the woods unless there’s an opportunity of finding a few “Smileys” so you will be pleased to know that on Saturday 15th August there will be 35 new caches released in Archallagan Plantation, 6 different icons on site plus the possibility of getting 3 other Icons on the way to the Plantation, 9 icons in a day on International Geocaching Day ! Now there’s a Challenge, even for the local cachers. Don’t worry if you can’t download the new caches, twoofnine have kindly offered to do it for you at the Welcome Event or at the CITO. 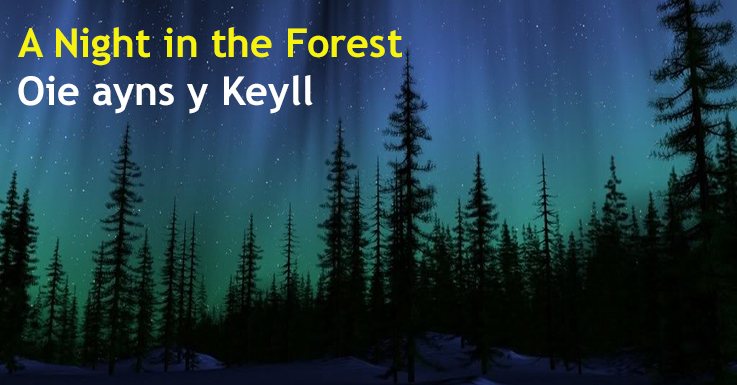 It wouldn’t be “A Night in the Forest” without a couple of Night Caches and twoofnine and Stillroaming have set a couple which we recommend doing, entirely at your own risk [:O], probably best done after 20.30 or later to get the full effect. Hope you all have a great week on our beautiful Island and see you all on Saturday. Only one week until the start of the ManxCacheFest!